I’ll be dressing up much more in the coming months too. It's the time of year to gather at parties and events, yay! Our calendar is already running out of space, November is completely booked! My first thought when I see all of our plans is, what will I wear? ( Then I picture the Grinch- smile- and begin my search. ) If this is your thought process too, I’ll save you a step. 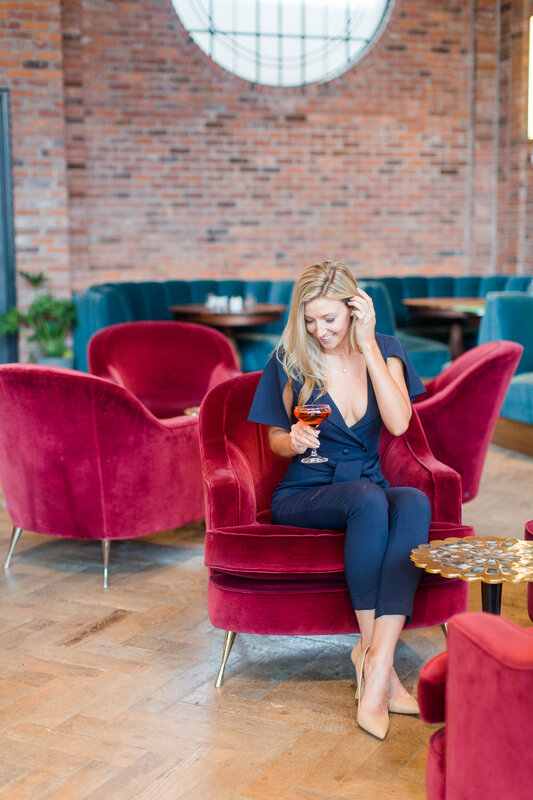 I've found the best evening jumpsuits with a trendy twist so you can celebrate and cheers with your best foot forward! If your parties are in New York, take an evening to swing by The Williamsburg Hotel. It's a newer boutique hotel in the Williamsburg neighborhood full of rich colors and textures. We came by for a few evening cocktails and explored their unique space (and jalapeno infused tequila-spicy!) and it took our breath away- literally! SEE MORE OF OUR NEW YORK TRIP (AND MY FAVORITE OUTFIT) HERE!